The Amsterdam Mohawks advanced to the 2014 PGCBL Championship Series with a 7-1 win over the Mohawk Valley DiamondDawgs. For the Mohawks, it will be their fourth straight PGCBL Championship Series, losing in 2011 and winning back-to-back titles in 2012 and 2013. Mohawk Valley finished the regular season with a 26-19 record, the third best in the PGCBL. Marcus Carson drove in the first run of the game with an RBI single in the top of the third that scored Blake Logan after Logan doubled to lead off the inning. Josh Gardiner droved in Carson with an RBI single of his own to make it a 2-0 game. The Mohawks added two more runs in the fourth on a Jonathan Pryor 2-RBI single that extended the lead to 4-0. Mohawk Valley’s Colin Hawk singled home Eric Strano in the top of the sixth to score the lone run of the game for the DiamondDawgs. Amsterdam responded with three runs in the top of the seventh to put the game out of reach. Tommy Kain hit an RBI single and Game One hero Alex DeBellis hit a 2-RBI double that scored JaVon Shelby and Josh Gardiner. Amsterdam starter Connor Johnstone was dominant for the Mohawks. The right-hander tossed seven innings, just allowing the one run, while only giving up four hits and walking one. Mohawk Valley’s Evan Kissinger allowed the seven Amsterdam runs (all earned) across six plus innings to take the loss. After rain and hail postponed game one to Saturday night, the Elmira Pioneers took a 1-0 lead in the West Division Finals with an 8-3 win over the Newark Pilots in Newark. The Pioneers are now just a win away from advancing to the PGCBL Championship Series where they would face the Amsterdam Mohawks. The game was scoreless until the top of the fifth inning when Elmira scored four runs on four hits. Michael Fahrman kept up his hot hitting with an RBI double that scored Christian Santisteban, Joey Guaragna plated Fahrman with an RBI single, and TJ Dixon and Taylor Hillson each hit RBI singles to score the two remaining runs. A Nick Walker RBI single extended the Pioneer lead to 5-0 in the sixth inning. Elmira made it an 8-0 game in the top of the seventh with three more runs. Christian Santisteban walked with the bases loaded to plate a run and Fahrman again hit an RBI double, this one driving in two runs to make it 8-0. Newark clawed back in the bottom of the ninth, but to no avail. Derek Reed hit a 2-RBI triple and Jack Gerstenmaier scored Reed with an RBI single, but Tanner Giesel lined out to center to end the threat and the game. Sam Sinnen tossed seven scoreless innings to pick up the win for Elmira. Sinnen allowed just four hits and walked two batters. Newark’s BJ Nobles went five innings and allowed four runs (all earned) in taking the loss. 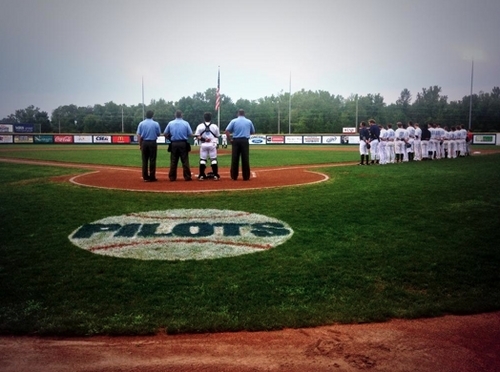 The Elmira Pioneers will host the Newark Pilots at Dunn Field with the opportunity to advance to their second straight PGCBL Championship Series. First pitch is scheduled for 5:05 p.m.